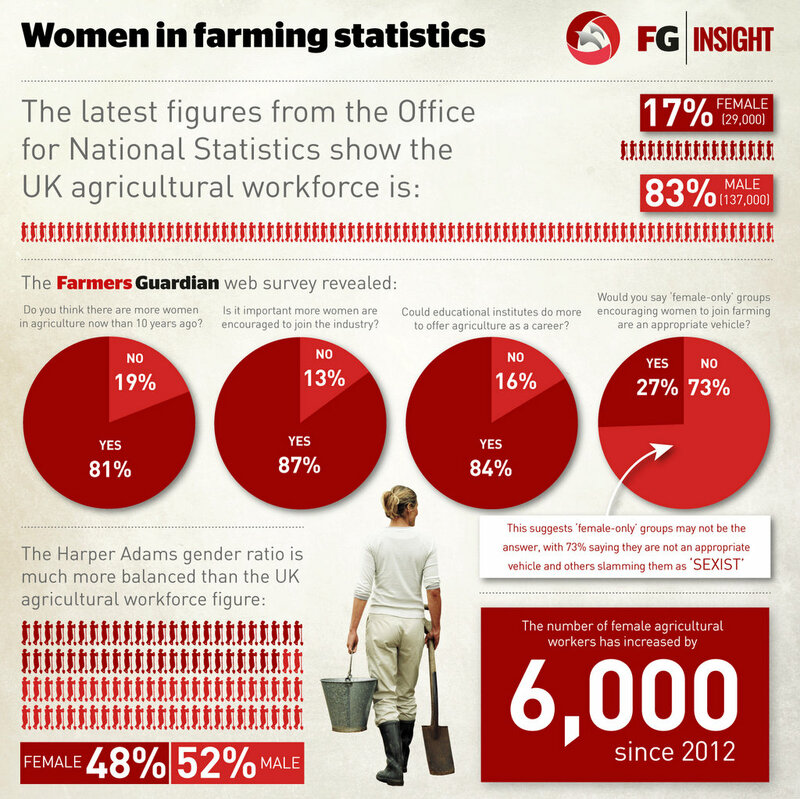 It is an undisputed fact there are more men working in the farming industry than women. The latest figures from the Office for National Statistics show 83 per cent (137,000) of the UK’s agricultural workforce is male, while 17 per cent (29,000) is female. However, research by Farmers Guardian has revealed the number of women entering the sector has increased by 26 per cent in the last three years – proof more women than ever are carving out careers in a predominantly male-orientated industry. While the figures represent women who are farming in their own right, an army of women – who for many years have undertaken background roles – have acted as the foundation for thousands of thriving family businesses. Dairy farmer Kathleen Calvert, who farms with her husband Derrick in Lancashire, said: "Women’s role in agriculture has been underestimated for years, but often we are the lynchpin in the farming business which holds everything together." An FG survey of more than 1,110 people showed while the future was positive for the sector’s women, work to entice the next generation was vital. The FG study revealed the education system played a key role, with 84 per cent of respondents saying institutions could do more to encourage female new entrants. More than 900 people (86 per cent) said it was important more women joined the sector. The situation has led companies and organisations such as Asda and the Royal Association of British Dairy Farmers (RABDF) to set up specialised groups to enable women to learn and share skills and experiences and discuss common industry issues. These sit alongside groups, such as the Women’s Food and Farming Union (WFU), which work to promote British food and farming. Asda agricultural manager Pearce Hughes believes these platforms help to boost the role of women in farming. Mr Hughes said: “Women have always been a key part of the British farming industry, but for many years their role has been largely unrecognised. "Today, many of the leading farmers are women and we at Asda feel it is important to recognise and promote this. Farming is an industry in need of fresh new talent and women have an increasingly important role to play in feeding the nation." However, FG research found female-only groups may not be the answer, with 73 per cent saying they were not an ’appropriate vehicle’ and others slamming them as ’sexist’. Jill Bathgate, a third-generation dairy farmer from Midlothian, said: "We are all on an even playing field and we all sell goods on the same market, so any form of segregation is a bad thing. "There are more women farmers than you think and in a 10-mile radius from where I am I can think of five. "However, I do not think we network well together. A lot keep themselves to themselves and often I find I am networking more with males." Groceries Code Adjudicator Christine Tacon has held various roles within the industry and is a non-executive director of the Met Office and Anglia Farmers and ran the Co-operative Group’s farming business for 11 years. She believes networking is key and has been instrumental in setting up the Ladies in Agriculture group which meets three times a year. Mrs Tacon said: "We discuss business issues and are there to support each other and particularly a younger generation working in our industry, so we have a broad spectrum of experience in the membership. "Networking for women is important because it can help women take the next step up the career ladder. It is basically what men in the industry have been doing for years." Karen Baybutt, financial controller at Preston-based salad growers Alan Baybutt and Sons, said there were now ’more opportunities than ever’ for women. She said: "As farming has become more commercially-orientated, the glass ceilings which perhaps held restrictions have been lifted and there are now far more opportunities within farming businesses for women to be actively involved. "A third of our workforce is female and although they sometimes play a different role to men, their roles are just as vital. For example, on the financial and accounting side, compliance and human resources." Ms Bathgate added: "Farming was once a man’s world because it was very much manual work, but this has changed so much in the last 20 years. Machinery now does a lot of the hard graft. For example, if I want to lift a 50kg seed bag, I will use a telehandler. "The advancement of on-farm technology has massively opened up doors for women to enter the sector." Nuffield scholar and farmer Jamie McCoy agreed agriculture should be seen as an ’equal opportunities’ industry. She said: "We need to attract the best people into the sector, regardless of gender, age and experience or background. "We want the best people for the jobs to create an industry fit for the challenges of the future. Fair wages, professionalism in the industry, good working conditions, opportunity for progression and flexibility are all vital. "It has never occurred to me I should not aim to farm because I am female. In fact I would say the opposite. I remember the first time I realised I would never be a farmer’s wife, but I would be a farmer in my own right, and I am still following that dream." The International Centre for Research on Women believes the face of agriculture around the globe is often female. In many of the world's regions, women work alongside men in fields to provide nourishment and income for their families. They contribute to commercial agriculture, which includes high-value products such as vegetables and cut flowers for local and export markets. In some societies, women also sell agricultural goods. However, more often than not, women’s contributions to the agricultural sector go unrecognised. Few small-scale women farmers are paid for their labour, and societal views of women’s roles restrict women's input in household decisions. Such beliefs also limit their access to land ownership, farm equipment and credit. It was a subject North Gloucestershire sheep farmer Tanya Robbins discussed as part of her Nuffield scholarship. Visiting Canada, Norway, Kenya, Uganda and India, as well as the Isle of Man and Ireland, Mrs Robbins saw first-hand how the role of women in agriculture had changed in different cultures. She said: "There are many progressive family farms in the UK, but unfortunately, there is still a pocket with old-fashioned views, believing the family farm should pass to a son, whether a daughter is better suited or not. "Women are more involved in food production in developing nations but generally do not have rights to land and business ownership." However, some countries were more progressive, Mrs Robbins found. "In Norway, I met women who have taken on their family farms through the Allodial Act, giving them, as the eldest child, the right to 'reclaim' the farm." "The perceived view of the 'farmer’s wife' is changing – we are farmers in our own right. Women are reaching new heights in agriculture. There is a groundswell of support, but we must have the confidence to forge ahead." "Men and women bring different things to the industry and we need to recognise this and encourage the fact we all have different skillsets which can complement each other. "I am not in favour of women-only groups as I think they can be quite divisive. However, they can be a nice way to share views. I think mixed groups are a better way of supporting farmers. "The advantage women have is many have gone into agriculture because they have chosen it as a career. Many men have not made an active choice to become a farmer." "I think women-only groups suggest there is inequality in the industry and I do not think there is. "Over the last 10-15 years, we have seen more women entering the industry, but there is still a lack of female new entrants. There is a perception farming is about sitting on a tractor and hiking bales around and it is male-orientated. But let’s look at all the opportunities available to women, for example on the cutting edge technical side. We should be promoting these jobs to women." Jamie McCoy is a dairy and sheep farmer and is a facilitator for the Farming Connect business advisory service, Pembrokeshire. "With my work off-farm running discussion groups, a women’s initiative was developed after research undertaken by Scottish Agricultural College found women are often the driving force behind implementing change in businesses. "Women, typically, do not attend events and meetings as frequently as men [they account for 17 per cent of attendees across all knowledge transfer events run by Farming Connect]. This may be because of work or family commitment – however, all events are open for women to attend." The industry needs the best practitioners no matter who they are or which background they are from. It will be the survival of the fittest, keenest and most inspired. We do not need treating separately. It then makes a big deal of something insignificant (gender). People should be judged on ability not gender. I think education is the key aspect, showing agriculture as a viable career path for intellectual young women and not purely physical work for the mere academically challenged. I have studied agriculture for five years, including at a top agricultural university, and worked on numerous farms, but still struggle to be taken seriously. I work predominantly with males and have no problem relating to them, although it did take me a while to be accepted as an equal. Farmer’s daughter, farmer’s wife, worked most of my life in farming. Still working at 60 and loving it.